Projections Future Forex System is trading system based on the Zig Zag indicator then is a cyclometric forex strategy based on the number 3 the perfect number. This strategy is suitable also for trading with binary options. I show two ways of this strategy: normal and filtered with Asymmetric Triangular Centered Moving Average. This system is based on free indicators and not use neural networks. Financial market: Forex, Futures and Commodities. 3 level ZZ semafor 5, 13, 34, 1,3, 8,5 ,21,12, 110,110,110. Ultimate Arrows (Zig Zag 80, 15, 10). Triangular Centered Asymmetric Band (50, 6, 2.61). Future predictor (14, 34) pointing upward. Future MACD (optional) for expert. If you want to trade in a time frame of 5 min, 15 min, 30 min or H1, always in the direction of the 4H or daily time frame. 3 The candle closes entirely above the Bézier curve. 4 Future predictor pointing upward. 5 Future MACD ( Histogram positive configuration). Profit Target on the level on the grid (discretionary). 2 Sell arrow white (MA CMA). 3 The candle closes entirely below the Bézier curve. Stop loss above the previous swing. TMA Asymmetric is as filter the Ultimate indicator arrow out the bands they are the best opportunities. Tip, when changes time frame when click on MACMA indicator or decrease the number of bars back. 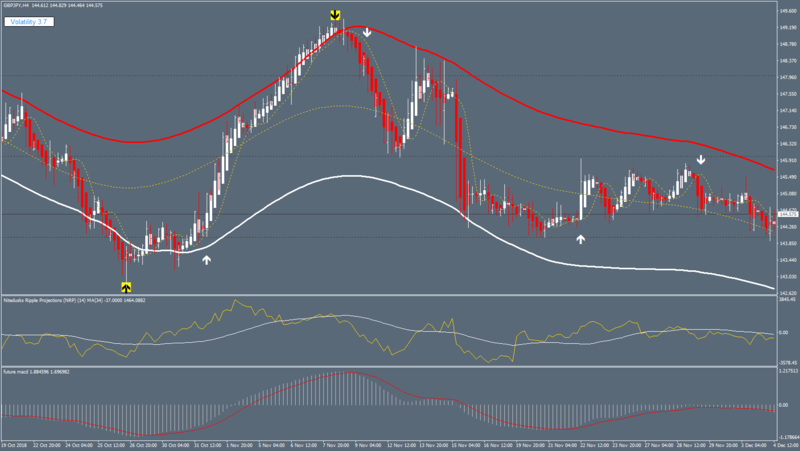 Note this is an experimental system the MA CMA indicator should be set for each time frame this is a median solution. In the pictures Projections Future Forex System in action. I added the DZ gann indicator. eliminated MA CMA with the previous rules and the results are better. Remember to add the dinamic Zone dll library. The change to the system is to have a psychological impact better than the previous ones. I have added a reversal cycle indicator. The results are in line with the previous ones but the visual impact is clearer. Happy Trading and good pips free.....!!! After working for more than a month on this strategy and studying works produced by others like FX Agimat, SDTR Strategy and others, I looked for a solution that could make the strategy work on all time frames. I added a trend line breakout indicator that redraws and the very powerful Bollinger Bands breakout filter that confirms the entry only on the break of the bands. Also I changed the navigation buttons between the value and the time frame. Compared to previous versions, entry is more precise. 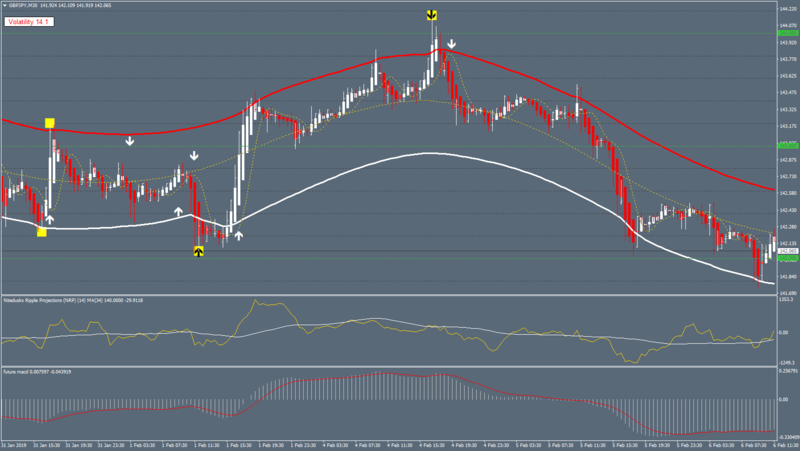 It 's important that the future projection indicator is taken into account after the bollinger bands breakout. 3 The candle closes entirely above/below the Bézier curve. 4 Bollinger Bands flat break upward/downward. 4.1 Future MACD ( Histogram positive configuration) optional. 5 Future predictor pointing upward/downward. 6 The upper time frame must have the same direction, but the configuration is at the discretion of the trader if the multitime frame filter is used. The best time frame to use this strategy is H1. Stable version based on indicators that do not recalculate. I made this version because it was requested by many to the admin of the site also the main request was to have a stable version at the time frame H1. I think it's a psychological issue. The other versions are also good. 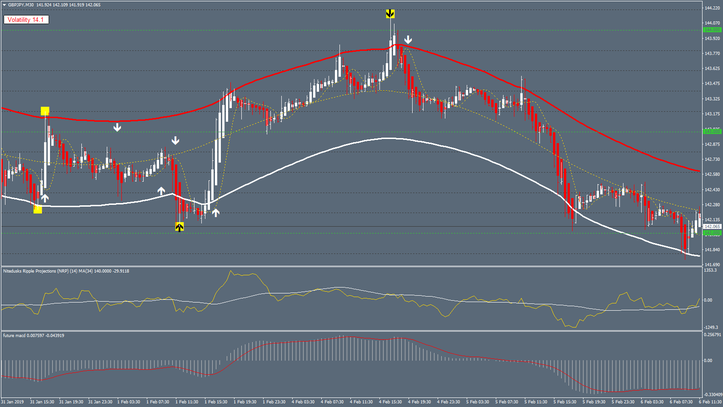 Here I added in addition to the space areas of oversold and over-bought especially for trading at H1. Time frame H1 and H4. Currencies Majors, Minor and Commodities. Bollinger Bands Stop (18, 2). WP Nostromo pivot levels (oversold inferior 61% - hypercomprasto over 61%). Trading rules future projections stable version. 1 Zig Zag Buy arrow in the red square. 2 Brain trend below the candle of price. 3 Bollinger Band blue dot. 4 Future prediction points upwards> of zero. 1 Zig Zag sell arrow in the red square. 2 Brain trend above the candle of price. 3 Bollinger Band red dot. 4 Future prediction points down <of zero. 7 The best trading opportunities occur in areas of overbought of Nostromo pivot levels. Being a highly profitable strategy with clear price targets, I recommend an anti martingale pyramid money management. I thank everyone for their support and constructive criticism in particular for joy22, Maximo trader and Admin of Forex Strategies Resources. This version is important because it breaks down the psychological wall that not everyone can overcome or that of the indicators that recalculate. for me it's normal but it's not for everyone like that. With these latest modifications, a profitable and free high quality strategy has been achieved. Great Job it' s free. God bless you. The last version of this trading strategy is very impressive. Easy. This version is simple to drive. and make money. Why don't you teach everyone that the MM is like a pyramid? Hi Janus, please I will like to connect with you and discuss with you. Can you help with your whatsapp contact/ instagram/ facebook id/ email?? With this system my trading is changed no longer use martingale I'm more comfortable if I lose because I make many winnings and if you can manage the position the pips won can be many. You are very good you should do a webinar on this system that helps you win. I'm very happy because I started winning constantly. Thank you. Could you have a scanner on signals, on time frames and currencies? This is a cyclometric strategy based on the zig zag. It takes time to get used to it. I'm testing a new indicator to add to balance the mental void that can create the zig zag. Hello Janus I can not see white arrows when Gann indicator changes color, can someone help me? Hello, it would be nice if there was a warning alert for the operation. P.S. I will comment on results. One the best trading system. Fantastic. Sep 30, 2015 ... Zig Zag Hist system is a strategy based on the zig zag indicator. This strategy is for is good for trading also with binary options high/low. Currency pair:any. This 3 level zz Semafor is a Zig Zag indicator. Metatrader indicators. AK 47 = 3 level zz Semafor is a Zig Zag indicator;. C2 Squad;. day1;.